Queensland Parks and Wildlife Service (QPWS) staff worked with traditional custodians to prepare displays for the new $1.8 million centre, the Cathedral Cave and Boolimba Bluff as well help overhaul the Baloon Cave walking track and rock art viewing boardwalk. The new dwelling includes modern rangers’ quarters and is serviced by an adjacent sandstone rest area and expanded car park. The latest suite of upgrades represents the final stage of a five-year endeavour undertaken by QPWS projects to improve the gorge’s facilities for visitors and staff. To minimise environmental impact, the new centre was constructed on top of the former centre’s site from materials sourced from the demolition. 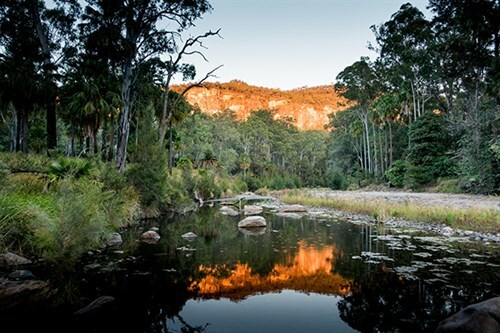 Tamara O’Shea, the director-general of the Department of National Parks, Sport and Racing who officially opened the centre in July, said that Carnarvon Gorge had been important to people for many thousands of years. “The permanent presence of water here sustains not only a rich diversity of plants and animals but also people,” she said. “Indigenous people have lived in, and travelled through, the gorge for many thousands of years. The Traditional Custodians consider this entire area to be a living, cultural landscape and have given much advice and mentoring to QPWS staff to help develop the displays. “Carnarvon Gorge is part of an iconic national park, recognised worldwide for its colourful, dramatic sandstone gorges and Indigenous art,” said Mrs O’Shea.